On a dark afternoon in February I stopped by the Aedes de Venustas boutique on Christopher Street in New York. I was on a short three-day trip to attend Elements Showcase, and finding myself with a small window of time before a dinner engagement, I had decided to take a chance that owners Karl Bradl or Robert Gerstner might still be in the shop. There had been a blizzard the day before and the snow in the streets was a combination of slush and crust. 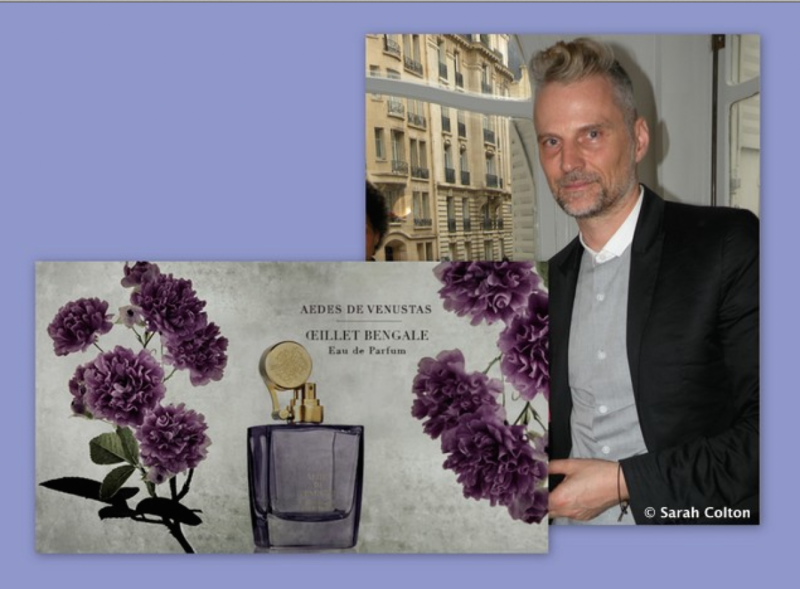 After announcing myself at the reception desk, I had a moment to browse among the glowing perfume displays before Karl emerged from the shadows of the back office, his smile a beacon of quiet assurance in the mauve tones of the boutique. I didn’t catch the name as he said it, but the moment I smelled the fragrance I recognized a rose — fresh, transparent and powdery. A rose with a distinct clove-like peppery smell that made me want to breathe in more deeply. “Ah, what a lovely rose!” I exclaimed, and then read for the first time the code name on the bottle: ‘Oeillet Noir CS’ (final) December 3, 2013′. ‘Oeillet’ means ‘carnation’ in French. When I left the boutique and entered the gathering darkness of the street I was wondering what a rose that resembles a carnation could possibly look like. But these musings were scattered by the immediate need to focus on where to place my feet on the icy sidewalk while navigating my way down Christopher street. At the corner of 6th Avenue I looked north to check the traffic, and a gust of wind whipped my hair into my face, and with it, a whiff of ‘Oeillet Bengale’. For an instant, sharp-edge winter mingled with something softly layered yet crisp.